In the Yankees’ unprecedented streak of five straight World Series titles between 1949 and 1953, Vic Raschi’s record was 92-40, an average of eighteen wins a season and a winning percentage of .697. From 1949, only his second full season in the majors, through 1951, Raschi won twenty-one games each year. Victor John Angelo Raschi was born in West Springfield, Massachusetts, on March 28, 1919. His nickname, “The Springfield Rifle,” combined the speed of his fastball and the name of the neighboring city—the site of the U.S. Armory which had been producing army rifles since 1794. His parents, Massimino, a carpenter who worked for the railroad, and Egizia had moved to Springfield when Raschi was still in diapers. Vic also had two older sisters and a younger brother. A star in baseball, football, and basketball at Springfield Tech High School, Raschi attracted the attention of Yankees scout Gene McCann while still a freshman. In 1936 Raschi signed an agreement under which the Yankees would pay for his college education in return for getting the first chance to sign him when he graduated. He enrolled at the College of William and Mary, in Williamsburg, Virginia, in 1938, and by 1941 the Yankees decided it was time for Raschi to begin his professional career. After the ’41 college baseball season, Raschi was sent to upstate New York to pitch for the Amsterdam Rugmakers in the Class C Canadian-American League. He continued to attend classes at William and Mary in the off-season. A 10-6 season at Amsterdam earned Raschi a promotion in 1942 to the Norfolk (Virginia) Tars, the Yankees’ affiliate in the Class B Piedmont League. His record at Norfolk was only 4-10, but he had an impressive 2.71 earned run average. World War II put both his career and education on hold. After spending three years in the Army Air Force as a physical-education instructor, he returned to school part time while pitching for the Yankees, earning a degree in physical education in 1949. In the meantime he had married Sarah “Sally” Glenn, a fellow student at William and Mary. The six-foot-one, 200-pound right-hander resumed his professional career in 1946 with the Binghamton (New York) Triplets in the Class A Eastern League. The Yankees called him up in September, following his 10-10 season for the Triplets and five games with the Newark Bears, the Yankees’ Class Triple-A affiliate. On September 23, 1946, at the age of twenty-seven, Raschi made his Major League debut before a tiny turnout of 2,475 at the Yankees’ home finale. Raschi, a “well-proportioned right-hander with burning speed,” pitched a complete-game 9–6 win against the Philadelphia Athletics.1 Six days later he won his second start, 2–1 over the A’s in the season’s final game. Given that successful debut, Raschi was bitterly disappointed when the Yankees optioned him to the Portland Beavers of the Class Triple-A Pacific Coast League in May 1947. Initially he refused to report but finally relented. In Portland he benefited from the tutelage of manager Jim Turner, a former Yankees reliever who in 1949 would become the Yankees’ pitching coach and remain in that position for the rest of Raschi’s career. Raschi compiled an 8-2 record with Portland, including nine complete games in eleven starts, and was called up to New York in July. The Yankees had won nine straight games, but on July 10, with starter Spud Chandler injured and Mel Queen sold to Pittsburgh, manager Bucky Harris telephoned Turner. Late that night, after a doubleheader in San Diego, Turner approached Raschi, who had won his fourth straight in the second game, and asked if he could be ready to pitch on Sunday, three days later. When Raschi said “Yes,” Turner told him he’d been recalled by the Yankees. Raschi showered and caught a plane to Portland before flying on to Chicago to join the Yankees. Raschi did pitch that Sunday, in the second game of a doubleheader in Chicago, giving up three runs in 6 1/3 innings to earn a 6–4 win over the White Sox. It was the Yankees’ fourteenth straight victory. Five days later, Raschi gave up six hits in a complete-game 7–2 win over the Indians in Cleveland. It was the final win in the Yankees’ nineteen-game streak, putting their record at 58-26 with an 11 1/2-game lead over the Detroit Tigers. Raschi’s first Major League loss was one of his best outings of the year. In an August 17 game at Yankee Stadium that according to the New York Times, had “all the thrill and excitement of World Series combat,” he shut out the defending American League champion Boston Red Sox on four hits for ten innings before giving up three runs in the eleventh. Five days later, Raschi’s record fell to 6-2 in a 4–3 loss to the Indians. His seventh and final victory of the season didn’t come until September 14, a 6–4 win over the last-place St. Louis Browns that clinched at least a tie for the pennant. For the season, Raschi compiled a 7-2 record with six complete games in 14 starts and a 3.87 earned run average. In the Yankees’ World Series victory over the Brooklyn Dodgers, Raschi made two relief appearances—in Games Three and Six—giving up one run on two hits in 1 1/3 innings. Though the Yankees finished in third place in 1948, Raschi won 19 games and lost just eight. He was the winning pitcher in the All-Star Game and also drove in the winning run with a bases-loaded single. He finished 11th in the Most Valuable Player voting after the season. Then followed three consecutive seasons with 21 wins (21-10, 21-8, 21-10); he averaged 263 innings and 34 starts, leading the league in starts in both 1949 and 1951. His winning percentage of .724 in 1950 led the American League. In 1952 his win total fell to 16 (with six losses), but his 2.78 ERA was the lowest of his career. 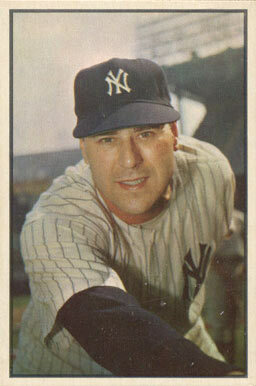 In addition to his 92-40 record from 1949 to 1953, Raschi made 160 starts for the Yankees. What makes this stretch of endurance even more impressive is that a collision at home plate with Indians catcher Jim Hegan in August 1950 resulted in torn cartilage in Raschi’s right knee. Playing in pain, he found it difficult to run or to put all his weight on his right leg when he pushed off the pitching rubber. Raschi and the Yankees kept the injury to themselves to prevent other teams from taking advantage by bunting on him. Not until November 1951 did he undergo surgery to remove the cartilage. In 1952 Raschi signed for a reported $40,000, making him at that time the highest-paid pitcher in Yankees history. But the signing came with a stern warning from general manager George Weiss: “Don’t you ever have a bad year.”2 Raschi’s 13-6 record in 1953 apparently was a bad year, according to Weiss, who offered Raschi a contract calling for a 25 percent cut in 1954. Refusing to sign, Raschi held out until spring training, one of twelve Yankee holdouts. When he got to training camp in St. Petersburg, Florida, he was informed by newspaper reporters, not by Weiss, that he had been sold to the St. Louis Cardinals. Raschi’s record in his eight years with the Yankees was 120-50, a .706 winning percentage. Raschi spent his final two seasons with the Cardinals and the Kansas City Athletics, compiling a combined record of 12-16 before retiring in October 1955 at the age of thirty-six. In his ten-year career, he won 132 while losing only 66, with an earned-run average of 3.72. As of 2011, his win-loss percentage of .667 was tied for fourteenth best for any pitcher with at least 100 decisions. He finished seventh and eighth in the Most Valuable Player voting in 1950 and 1951 respectively, and he pitched in four All-Star games, starting in both 1950 and 1952. In eight World Series starts, Raschi won five games (against three losses), including a two-hit shutout of the Philadelphia Phillies in the 1950 opener and two wins over the Dodgers in the 1952 Series. His World Series ERA, including his two relief appearances in 1947, is 2.24. But perhaps his most memorable game came on the final day of the 1949 season when the Yankees hosted the Red Sox with the pennant at stake. The Red Sox, who had trailed the Yankees by twelve games early in July but stormed back to take a one-game lead with two games left, needed to win only one of the two to take the flag. But the Yanks won the first game 5–4 to force the Red Sox into a do-or-die finale. Raschi, with a 20-10 record, was matched up against Ellis Kinder, who had won twenty-three (four against the Yankees) and lost five going into the game. With 68,055 fans on hand, Raschi, given a 1–0 lead in the first, shut down the power-laden Red Sox on two hits over the first eight innings; the Yankees then took a 5–0 lead after scoring four in the eighth. But the Red Sox, who had been favored to win the pennant, wouldn’t go quietly, scoring three runs in the ninth with the tying run at the plate in Birdie Tebbetts. First baseman Tommy Henrich approached Raschi to offer some encouragement. But the glowering Raschi was in no mood for chit-chat and before Henrich could say a word he told him, “Give me the goddamned ball and get the hell out of here.”5 He then got Tebbetts to hit a foul pop that Henrich squeezed for the final out and the pennant. After his retirement Raschi and his family settled in Groveland, his wife Sarah’s hometown in upstate New York on the shores of Conesus Lake. Raschi owned and operated the Green Valley Liquor Store in nearby Conesus. He also coached baseball and basketball at Geneseo State Teachers College (now the State University of New York at Geneseo), where the baseball field was named in his honor. In 2001 he was posthumously inducted into the Geneseo Sports Hall of Fame. Beginning in 1969, at the age of fifty, he also taught elementary school. Raschi died of a heart attack on October 14, 1988, at the age of sixty-nine, survived by his wife, son William, daughters Victoria and Mitje, and two grandchildren. This biography appears in SABR's "Bridging Two Dynasties: The 1947 New York Yankees" (University of Nebraska Press, 2013), edited by Lyle Spatz. Berra, Yogi, with Dave Kaplan. Ten Rings: My Championship Seasons. New York: Morrow, 2003. Creamer, Robert. Stengel: His Life and Times, 1984. Reprint, Lincoln: University of Nebraska Press, 1996. Gittleman, Sol. Reynolds, Raschi and Lopat: New York’s Big Three and the Great Yankee Dynasty of 1949-1953. Jefferson, NC: McFarland, 2007. Honig, Donald, ed. Baseball Between the Lines: Baseball in the Forties and Fifties As Told by the Men Who Played It. 1976. Reprint, Lincoln: University of Nebraska Press, 1993. Kahn, Roger. The Era: 1947-1957, When the Yankees, the Giants and the Dodgers Ruled the World. New York: Ticknor and Fields, 1993. Author interview with Jerry Coleman, September 1, 2005. 1. New York Times, September 24, 1946. 2. Honig, Baseball Between the Lines, 179. 3. Henrich, qtd. in New York Times, February 23, 1954, 31; Coleman, personal interview, September 1, 2005; Creamer, Stengel, 327. 4. Honig, Baseball Between the Lines, 175; Berra, Ten Rings, 115. 5. Honig, Baseball Between the Lines, 173.